… What? You’re looking this way like you see a crazy person. Crazy!? No, not here. Just tea. And hats. Tea and hats. And madness. Oh!Haha! You are a tricky one, aren’t you? Clever as the Dormouse and quick as the March Hare! 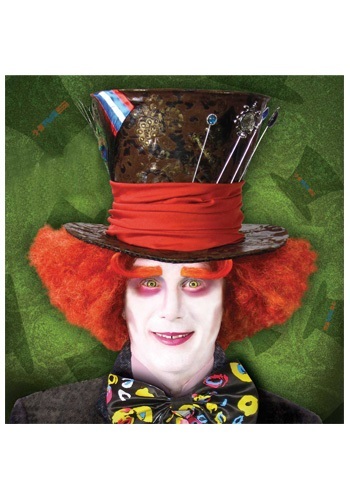 But, can you keep up with the Mad Hatter!? Or, more importantly, his style? Hats are one thing and tough to come by, but you can’t just throw any old hat on any old head. You have to make sure that you have the right hair on which to set the right hat! In Wonderland, the Mad Hatter simply cannot provide the right hat that sings to your soul unless you, first, have the right ‘do! Let us handle that for you, though, with the Mad Hatter’s own wig, a bright and fiery orange that will finally match your fiery personality! Styled in a Depp-endable form that won’t lose it’s shape, you can be sure that every hat will be the perfect complement… and that you’ll get your compliment from all the guests at your Mad Tea Party!